Maybe you finally decided to ditch the lame (and expensive, and ill-fitting…) store-bought Halloween costumes and make your own this year. Or maybe you’re just not immune to the Call of the Geek and you’ve finally caught the Cosplay bug. Whatever your reasons for making your own costume, if you’re a beginner you’re going to need some help getting started. So, young Padawan, if you’ve never shopped for fabric before, allow me to drop a little knowledge on you. 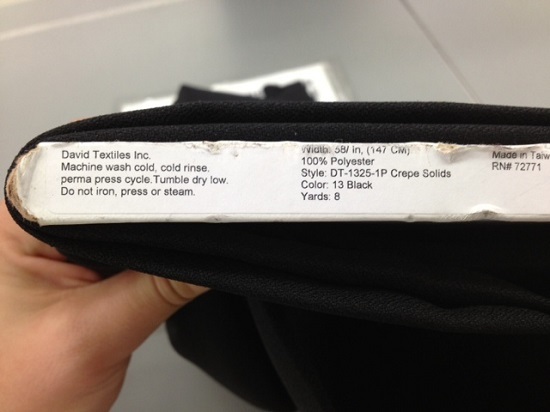 The first thing you need to know about choosing fabric for crafting/costumes is what kinds of fabric to look for. Stuff that doesn’t fray is really great (unless you are willing to invest the sewing time or are going for a shredded look.) Also, unless you are just determined to sew everything you touch, you’ll probably be doing a lot of hot gluing so you don’t want it to melt. You can check out my favorite fabrics for crafting & costuming to get ideas. Unless you’re a textile expert, the bolt label is your best friend. Know it. Love it. Cherish it’s sweet, sweet wealth of information. Wtf is a yard you ask? Oh yeah, that’s the super funnest part of fabric shopping: it’s not sold by the foot, oh no. That would be too easy. You gotta earn the right to play with fabric my friends! One yard is equal to 3 feet and 3 feet is equal to 36 inches. The third thing you need to know is that fabric is sold by the yard. So if the price sticker says $5.99 that means $5.99 per yard. That’s important when calculating cost. $12.99 doesn’t seem expensive… but buying 4 yards would be almost 52 bucks! Unless it’s some really great fabric, I say that’s way too much, but it really depends on your budget and the fabrics available in your area. After you’ve determined how many yards you need (and can pay for), take the whole bolt to the cutting table. They will measure out what you request, cut it and give you a “receipt” with your total cost to take to the register and pay. Be patient if you head to one of the big chains in the season leading up to Halloween (mid-August through October). Actually, August through November, because the little old grandmas really love to sew stuff for Xmas too. Anyways, be sure you have the fabric you want and have your measurements ready when you get to the cutting table. Once they cut the fabric for you it’s super douchy to change your mind. So now you know, and hopefully you won’t look like too much of a Sewing Tourist down at your local JoAnne’s.